The Institute for Technology Law & Policy at Georgetown Law is training the next generation of lawyers and lawmakers with deep expertise in technology law and policy. 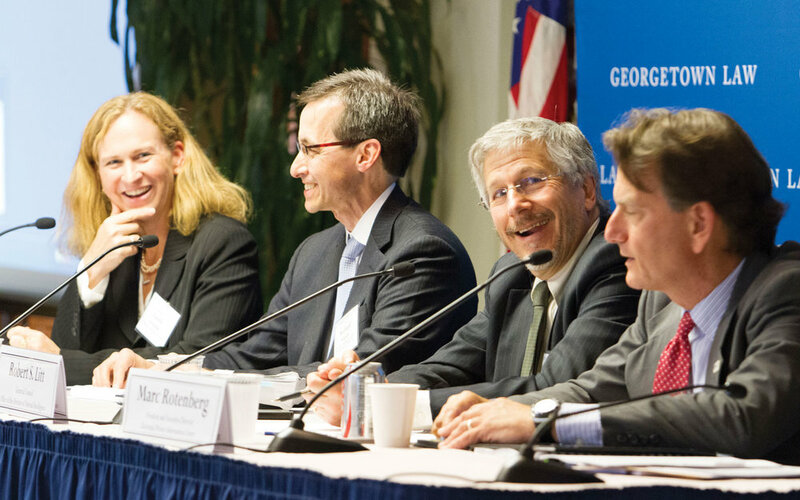 The Institute provides a uniquely valuable forum in Washington, DC for policymakers, academics and technologists to discuss the most pressing issues and opportunities in technology law today. Former U.S. magistrate judge John Facciola, a leading authority on e-discovery, teaches his Georgetown class on Information Technology and Modern Litigation. At Georgetown Law, students gain a world-class education in technology law and policy from leaders in the field. Our faculty have worked at the Federal Trade Commission, Federal Communications Commission, U.S. Patent & Trademark Office, the White House, in Congress, and on the Federal Circuit. Georgetown Law’s Tech Law & Policy Scholars program formally recognizes students’ deep focus on technology law. And the Georgetown Law Technology Review, affiliated with the Institute, provides a forum for students and scholars to further explore issues at the intersection of technology law and public policy. Student Arvind Miriyala (L'17) presenting his team's app at the Iron Tech Lawyer competition. Elon Musk's Neuralink: Privacy Protections for Merged Biological & Machine Intelligence?